I got the chance to experience Hong Kong and Macau for almost a week. We got to tour almost all of the famous spots in the place. We experienced a lot of different exciting things. But, here are some of the most important things I learned from the trip. 1. Travels are stressful but rewarding. 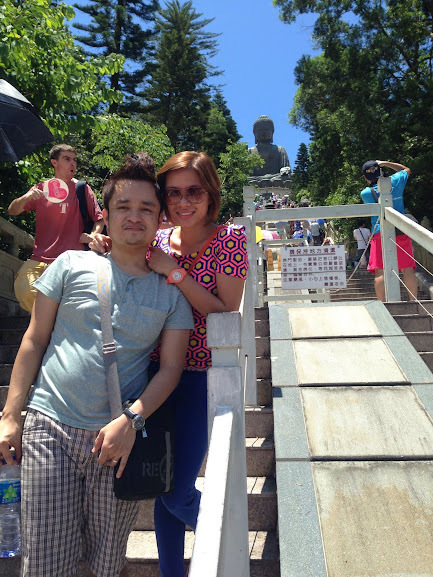 The 4 days at Hong Kong and Macau were filled with hours of walking, rushing and riding the public transportation. It was also summer time when we were there so it was really hot. All of those were stressful, tiring and even draining. However, all those sweat and stress were worth it. Every experience that came with it were definitely rewarding. We've gone to places we have never been before, we have experienced Hong Kong at its best and we got immersed with their culture and people. 2. Hong Kong is a fast paced and organized city. The people in Hong Kong are always on a rush. Their lifestyle is so fast paced that people would get mad if you walk slowly on the streets. Aside from that, people follow the rules. They go through a system and abide by it. This is such a good thing. It is very much evident with their transport system. Even though Hong Kong is one of the most densely populated areas in the world, public transportation was never a problem. There are designated stops, they use an efficient system of payments, they have a really good railway system, road signs. Road warnings are also very clear, visible, and understandable. It is such an ideal place to live in. There are Filipinos in every corner of Hong Kong. That is not an exaggeration. I see them everywhere. The good thing is that these Filipinos even though they've stayed at this city for quite a while continue to remain humble, hospitable and generous. Whenever we stumble on Filipinos, they are always ready to help and even share what they have. There were instances where we almost got lost. But, there is always that one or two Filipinos around who will offer their sincere help. 4. This travel was a blessing. If there was one important thing I realized after this trip, it was the fact that God has blessed us so much that he made this trip possible, enjoyable and hassle free. I rarely get to take a week off from work but I was able to. Everything was set. Friends were supportive and offered to help us with the itinerary. We even got past a bomb threat here at our local airport and the huge storm only came out after our trip. God has also provided my girlfriend's aunt to take care of us for the whole duration of the trip. She treated us like her sons and daughters. Without her, our stay at Hong Kong wouldn't be that easy. This trip is definitely a huge blessing. It was one of the best experiences ever. I would like to end this post with one important lesson I learned from my girlfriend's aunt. We kept on thanking her for her generosity and hospitality at the end of trip. We told her that we do not know how to repay all of those things she did. This was what she told us: "When you give and share your blessing, do not ask the recipient to give something in return. Instead, ask them to pass it on so they can also be a blessing to others." I will definitely never forget that for the rest of my life.